Gilroy Gardens has designed special attraction entry procedures to safely help guests with disabilities enjoy their park visit. Download the Guest Assistance Guide or visit Guest Services in-park for more information. 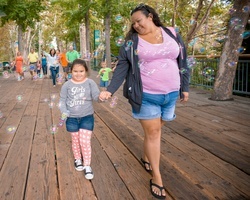 At Gilroy Gardens, we are proud of our reputation for accommodating guests with disabilities through our Ride Admission Policy. We have developed a Boarding Pass Program which allows guests with mobility restrictions or Autism Spectrum Disorder (ASD) to access rides at specified times via the exit ramp in order to avoid crowds and waiting in the regular queue lines. The guest with a mobility impairment or ASD should visit the Welcome Center upon his/her arrival at the park to express his/her inability to wait in the regular line. Some questions are asked to ensure that the rider has the required physical criteria in order to safely experience rides, and a Boarding Pass is issued for the guest in question and up to 3 riding companions. You may be asking yourself whether Gilroy Gardens is appropriate for guests with an autism spectrum disorder (ASD) or whether your loved one on the spectrum will be able to handle the theme park experience. 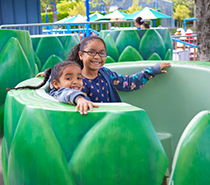 Gilroy Gardens has taken steps to be well-prepared to welcome and provide accommodations for all types of disabilities, including autism and related disorders. To continue to provide equal access for all guests, be aware that all guests with mobility impairments or ASD will receive a Ride Boarding Pass with wait times. Please review the Boarding Pass Program for more details. As you know, advance planning is a requirement for any successful theme park visit with a person with ASD. Your visit to Gilroy Gardens will include a plethora of sensory stimulation including crowds, loud theatres, coasters operating, lights and noises, waiting in line, to mention a few. 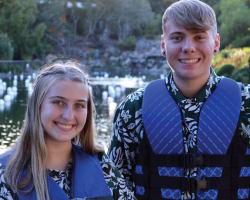 At Gilroy Gardens, we strive to provide equal opportunity to all of our guests while providing a variety of options tailored to specific needs. Our highly trained staff is knowledgeable and eager to assist. You can find information on our rides and attractions in advance on the website. The park’s Guest Assistance Guide is also available for download. The Guide outlines the specifics about each attraction, including height requirements and health restrictions. Feel free to contact our Call Center in advance at (408) 840-7100 with any additional questions. When you arrive at the park, please proceed to the Welcome Center located in Sugar Plum Plaza. 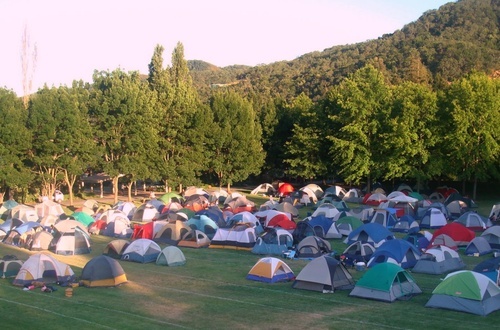 Please have the individual requiring accommodation accompany you to the Welcome Center. Additionally, if you need to rent a stroller, wheelchair or locker, proceed to Stroller Rental just inside the front gate. Please re-visit the Welcome Center if you need any additional help with your day. Guests who wear headphones of any type will not be able to wear them while riding our attractions. We have available disposable ear protection for use at the Welcome Center. 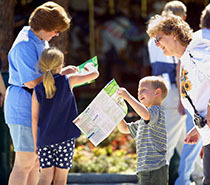 Gilroy Gardens offers our guests several restful locations places that your party can enjoy during the day. The park has a first aid station behind Monarch Garden. You may access the area via the gate at the exit of the Quicksilver Express ride. Additionally, our air-conditioned restaurants may provide a nice break from the sensory stimulation. Gilroy Gardens is a wonderful destination for families and friends to visit. Our goal is to make your experience at the park both smooth and full of family fun. Please let us know if you have any further questions by contacting (408) 840-7100 or by talking to a guest service representative at the park. Guests with disabilities should stop by the Welcome Center located in Sugar Plum Plaza upon arrival at the park. A brochure (Guest Assistance Guide) detailing the many special accommodations and our Ride Admissions Policy is available from the Welcome Center. Single and double-seat strollers and a limited supply of wheelchairs and electric convenience vehicles (ECV) are available for rental at Stroller Rental just inside the Front Gate. However, since wheelchairs and ECVs are rented on a first-come, first-served basis and cannot be reserved in advance, we urge guests to bring their own wheelchair. Pricing is $13 for a single stroller, $18 for a double stroller, $15 for a standard wheelchair and $55 for an electric wheelchair with a canopy. Gilroy Gardens’ Ride Admission Policy and Alternate Access Entrances are designed to help you safely experience our facilities. Rides with Alternate Access designations will make boarding easier. If you require the use of an Alternate Access Entrance to enter a ride, please visit the Welcome Center to obtain a Ride Admission Slip. Service animals are welcome at Gilroy Gardens. A service animal is defined as a dog or miniature pony that has been individually trained to perform tasks for a person with disabilities. We may ask you what task your service animal performs for you. Service animals must be controlled with a “restraining device” at all times while on our property. There is a limit of one service animal per guest. Due to the nature of most rides, service animals must remain with a non-riding member of your party. We are not permitted to take control of your service animal. Service animals are not permitted in water attractions, wet decks, or wading pools. A relief area is located adjacent to Oak Park Playground behind the Apple and Worm ride. Please stop by the Welcome Center for more information. Guests with casts and braces will be restricted from riding rides where the cast or brace will not fit inside the ride unit or where it will present a hazard to the guest or others. Guests with full arm (elbow restricted) and full leg (knee restricted) casts or braces are restricted from most rides and water slides at Gilroy Gardens. We suggest you delay your visit until the cast is removed. Please refer to each ride admission policy for further information regarding casts and braces, or call (408) 840-7100. Guests with any type of prosthesis should not ride unless they can ensure the device is properly secured and will remain in place during the ride. If there is any concern of the prosthesis becoming dislodged during the ride, guests should visit the Welcome Center for assistance.